Adventure, Ayurveda, Beaches, Culture, Great Hotels, Hill country, Nature, Tea, Scenery, Spa, Service, Underwater, Villages ........... there are an infinite number of reasons for exploring Sri Lanka. In this publication, we hope to introduce you to just one of a million facets of this magical island. Primates have a universal appeal. Perhaps it is because they look and behave so much as humans do. The interest in primates has shifted from watching captive animals in zoos to seeing them in the wild. Specialist tour operators and conservation organisations have increasingly begun to offer primate watching tours to a wider audience. Sri Lanka is a special place for primates. With at least five species, it is very rich in terms of primate species per square kilometer. But what makes Sri Lanka special is the ease in which large numbers of primates can be observed. In many of the cultural sites, the primates are used to people and can be observed in a very relaxed atmosphere, playing, grooming, bullying, sleeping, squabbling...... like us really. This publication will give you a concise introduction to the primates of Sri Lanka. The sites for primates which are listed here are also good for seeing the bio-diversity for which Sri Lanka is so famous. You can travel around alone to observe primates as the island has a good network of roads and accommodation. However, booking with a specialist tour operator who provides you with a naturalist guide may contribute to a more rewarding experience. Sri Lanka’s three diurnal (active during the day) monkeys all belong to the family Cercopithecoidea, or old world monkeys. This can be further divided into two sub-families of which the Colobinae includes the langurs and the Cercopithecinae which includes the macaques. Sri Lanka’s endemic purple-faced leaf monkey (Presbytis senex) and hanuman langur (Presbytis entellus) belong to the former. The endemic toque macaque (Macaca sinica) belongs to the latter. Leaf monkeys are long-tailed monkeys that live in the trees, where they eat mostly leaves. The purple- faced leaf monkey has two races in the wet lowlands, one to the north of the Kalu Ganga (river) and one to the south of it. 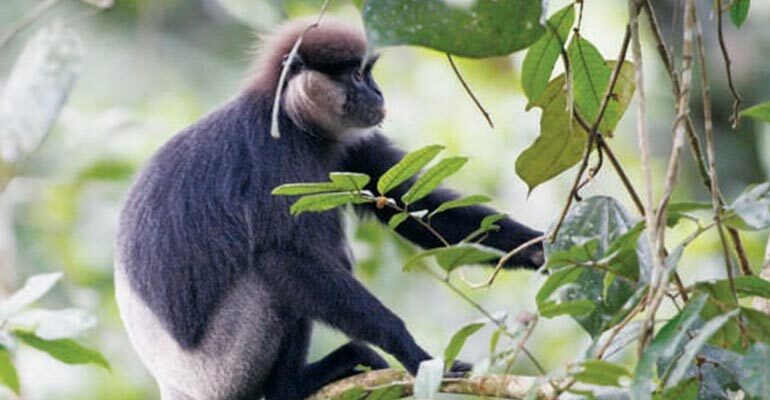 The western race (the one to the north of the Kalu Ganga) is found in places such as the Talangama Wetland, around Bellanwila Attidiya and the Bolgoda lake. It is critically endangered, mainly due to loss of habitat. The southern race (to the south of the river) can be seen in Sinharaja Rainforest. It has a prominent white patch on its rump and side of the rear legs. The tail is frosted white. Another race in the highlands, known as the bear monkey, has a shaggy coat to offer protection from the cold. The other leaf monkey, the graceful hanuman langur, has long limbs, a pale grey-brown coat and a dark face. Long eyelashes help it to avoid the glare when feeding in treetops. 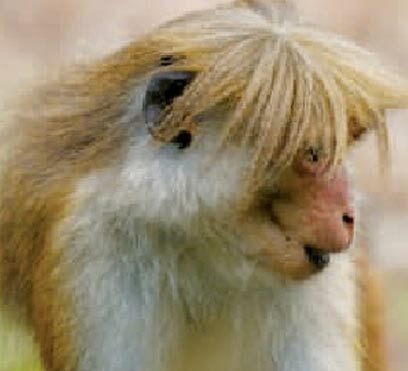 Generally leaf monkeys are shy and not likely to trouble people. 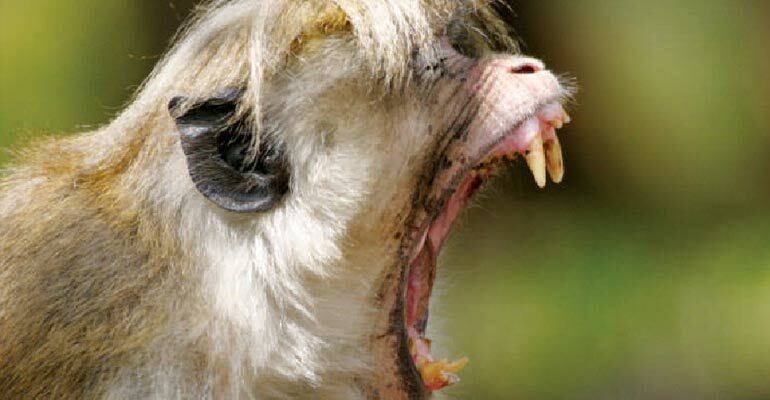 But at least one habituated population of hanuman langurs has shown aggression, and this usually inoffensive animal can be a formidable sight when gnashing its fearsome incisors. 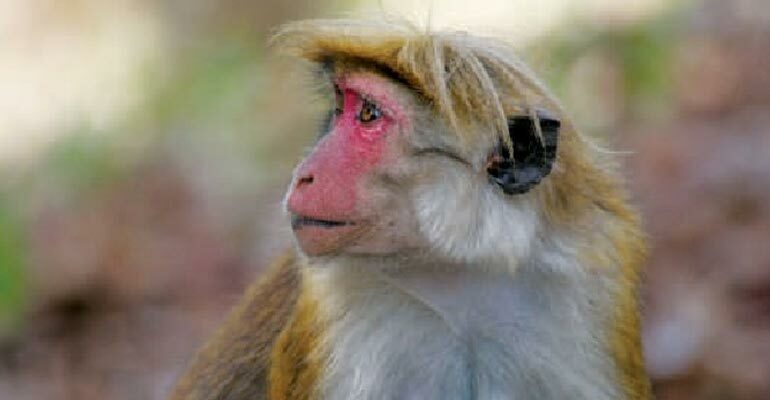 The toque macaque – or toque monkey – is a compact and shorter-tailed monkey, with reddish – to yellowish-brown fur, and is more terrestrial in its habits than leaf monkeys. Like all cercopithecines (cheek-pouch) monkeys, it has cheek pouches that contain enzymes to break down toxins in plant matter. These pouches – absent in leaf monkeys – also help it to deal with feeding competition, allowing toque monkeys literally to stuff their faces. Sri Lanka’s pronounced climate zones have resulted in three races of the toque macaque, with one in the dry lowlands, one in the wet lowlands and one longer-haired race in the highlands. Most cheek-pouch monkeys maintain male-dominated hierarchies with an alpha male. However, studies of toque macaques show that the troops are formed on matrilineal lines, with females providing the stable core. This species is hierarchical and the young of higher placed females inherit a higher status in the troop. Toque macaques are widespread in Sri Lanka and can be common in some populous areas. They should always be treated with caution – especially where people feed them, which creates an illusion that humans are subordinate. Lorises are among the most ancient of primates. Sri Lanka has two species, the grey loris (Loris lydekkerianus) and the red loris (Loris tardigradus). The grey loris is present in good numbers in the north – central province, around Sigiriya and Polonnaruwa. The red loris is smaller and more active, almost scampering across branches. It occurs mostly in the wet-zone lowlands. Two separate highland races, one found in Horton Plains National Park and one in the Knuckles range, may yet be classified as separate species. The two species of lorises are both small mammals and can fit inside a pair of cupped hands. They don’t have a tail and have two large, saucer like eyes facing forward. Lorises make use of their sense of smell in marking territories and signaling readiness to breed. One of the digits on the forearms has a special claw called the 'toilet claw', which they use for scratching and also cleaning out their ears. Day to day monkey social dynamics is structured around alpha males who control a harem of females. Sharp canines can inflict fatal injuries on rival males. 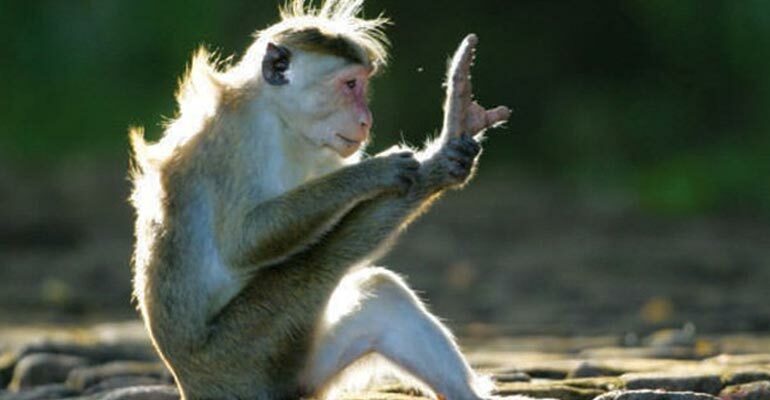 People should also keep their distance from habituated monkey who have lost their fear of humans. Top and right: Highland race of the toque monkey. Bottom: Hanuman langur. Sri Lanka offers outstanding opportunities to observe primates at close quarters, all year-round. The following are among the best sites. On the outskirts of Colombo, the Talangama Wetland is a 30–45 minute drive from central Colombo, where accommodation is easily available. It is a reliable location in which to see the critically endangered, western race of the purple-faced leaf monkey. It is also good for birds and dragonflies and for observing traditional rural life. The Hakgala Botanical Gardens are 15–20 minutes drive from the highland town of Nuwara Eliya. Above it is the Hakgala Strict Nature Reserve, a refuge for rare montane plants and animals. 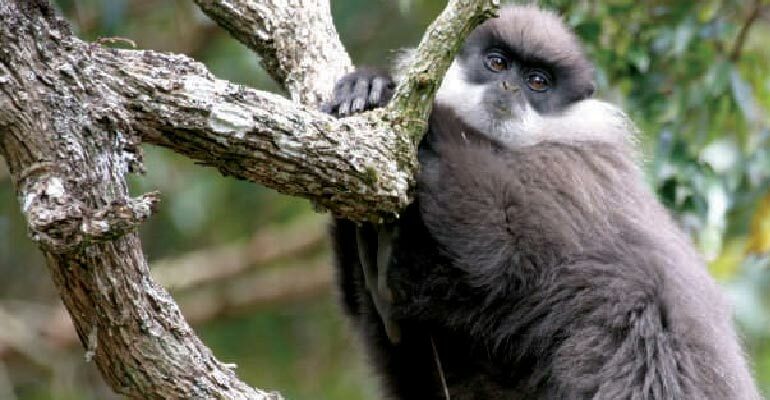 The montane races of both the purple-faced leaf monkey, known as the bear monkey, and the toque monkey are most easily observed here. Both species are used to people, the toques at times alarmingly casual. Elsewhere, the bear monkey is usually very shy and crashes away at the merest hint of people. The forbidden forest of the ancient Kandyan kings is on a hill behind the famous Temple of the Tooth Relic, which overlooks the Kandy Lake. The wet zone race of the toque monkey, known as the dusky toque, reigns supreme here, in large quarrelsome troops. Don't feed them: this will only encourage aggression. The archaeological sites in the north central province are surprisingly rich in primates, with the dry lowland race of the toque macaque, the northern race of the purple–faced leaf monkey and the hanuman langur all occurring in troops together. The leaf monkeys are less shy than usual at these heavily visited sites but, being leaf-eaters, are not likely to show an interest in your sandwiches. The hanuman langurs and toque macaques are both quite bold, and the latter will steal your food given the chance. This area is also very good for the nocturnal grey loris. Kottawa, Hiyare and Kanneliya are rainforests that can be reached from Galle. Kottawa and Hiyare are within a half hour's drive; Kanneliya is at least one–and–a–half hours away. The southern race of the purple – faced leaf monkey occurs in small, very shy troops in these lowland rainforests. The nocturnal and endemic red loris also lives here, but is hard to find. The Prosimians are considered the most ancient order of the primates. In Sri Lanka it was believed until recently that only one species, the Grey Loris (Loris lydekkerianus) was present. However the loris found in the wet zone lowlands is distinctive, both behaviorally and in terms of size and appearance. Recently it has been split into a new species, the Red Loris (Loris tardigradus). The Red Loris is smaller and more active. It can move rapidly, almost scampering on branches. The highland race found in Horton Plains National Park and the isolated population in the Knuckles range are also potential candidates for a split. Lorises have a tapetum behind the retina. This is a reflective layer of cells which reflects light back through the retina, effectively giving the eyes a second pass of the light, to improve night vision. Cats also have a similar tapetum, but have evolved it independently. The eye shine from Lorises is one of the best ways to locate one at night. But those engaging in loris watching should use a red light as Lorises are not sensitive to red light. LCD lights should not be used as they may be damaging to animals. Lorises use smell a lot in marking territories and signaling readiness to breed. They have large nostrils and scent glands which belie the importance of smell. One of the digits in the fore arms has a special claw called the 'toilet claw'. This is used for scratching and also inserted into the auditory canal for cleaning the ears. Lorises also have a modified tooth with comb –like serrations. 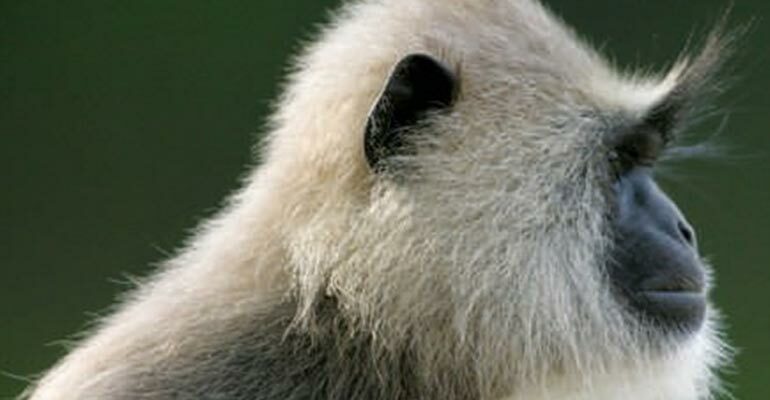 The tooth-comb is used for grooming its fur. Lorises have a range of vocalisations. But for the most part, a short shrill whistle is all that is heard. This is easily overlooked for an insects call. This and their un-obtrusive behaviour may explain why people are often not aware of the presence of lorises in a forest. The montane race, went un-detected for over seven decades before a three day search by primatologist Dr Anna Nekaris found it again in the Horton Plains National Park. 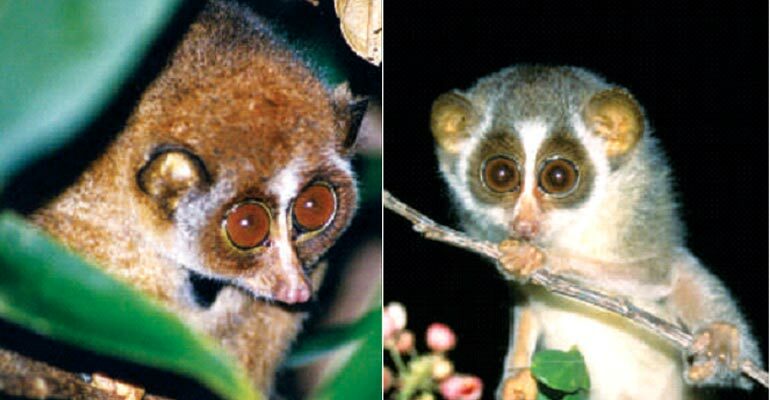 The red loris (left) and grey loris (right) are not rare, but scarcely seen because of their nocturnal habits. Top: The southern race of the purple-faced leaf monkey which visitors are likely to see in Sinharaja, has a prominent silver frosted back and white tail. Bottom: The bear monkey (bottom) is the highland race of the purple-faced leaf monkey. It is usually very shy except in a few places like the Hakgala Botanical Gardens where they have become habituated. Sri Lanka has three species of diurnal primates ( two are endemic) and two species of nocturnal primates (two lorises with one endemic). It is probably one of the best places in the world to observe the social dynamics of diurnal primates. 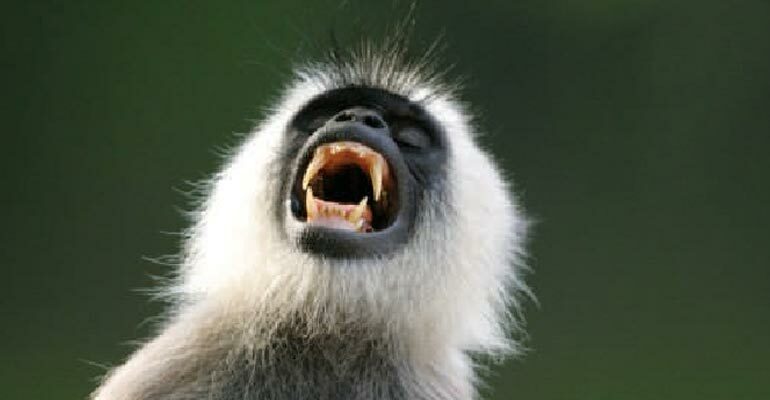 The endemic Toque Monkeys have been studied in one of the longest running field studies in the world. DAY 01 Transfer to hotel in or near Colombo for two nights. Afternoon visit the Talangama Wetland area to look for the critically endangered western race of the Purple-faced Leaf Monkey. DAY 02 Morning, leave for a nearby forest reserve, which holds the western race of the Purple-faced Leaf Monkey and Toque Monkey. DAY 03 After breakfast, leave for Sigiriya for two nights. Afternoon, visit Sigiriya Rock Fortress for troops of Toque Monkeys and Hanuman Langurs around the Sigiriya moat. DAY 04 Morning, visit Polonnaruwa, a UNESCO archaeological site, to watch troops of the dry lowland race of the Toque Monkey, the northern race of the Purple-faced Leaf Monkey and Hanuman Langur. Afternoon, safari to Minneriya National Park for Elephants. DAY 06 Morning, visit the Temple of the Tooth Relic in Kandy before departing to Nuwara Eliya for two nights. Afternoon, visit the Hakgala Botanical Gardens for the montane races of both Purple-faced Leaf Monkey and Toque Macaque. DAY 07 Morning, visit Horton Plains National Parks to see cloud forests and montane fauna, such as the endemic Rhino-horned Lizard, which was featured in Charles Darwin's monumental work on evolution. Mammal highlights include Bear Monkey, Giant Squirrel and Sambar. Afternoon, another visit to Hakgala Botanical Gardens. DAY 08 Transfer to Negombo for one night.